VoIP Market size in 2018 was over USD 20 billion and is estimated to grow at a CAGR of 12% from 2019 to 2025. 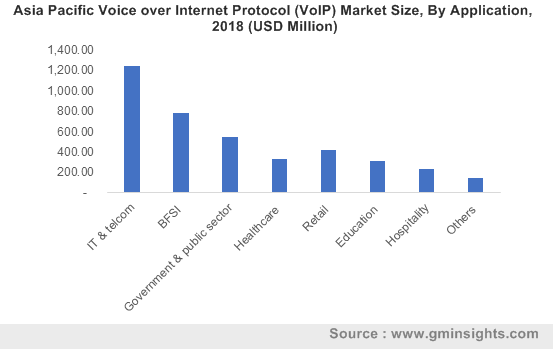 The VoIP market growth is attributed to factors such as efforts taken by government agencies & private companies for the development of the wireless communications infrastructure and the increased adoption of cloud-based VoIP services due to cost-efficiency. Businesses with poor communication infrastructure face issues such as low audio quality and long delays that can adversely impact their productivity. Thus, they migrate from traditional phone systems to cloud-based phone systems, which are tailored to handle voice mails & calls to enable smooth communication. As technology supports voice & video communications over the internet, enterprises are widely using such solutions to enable high business performance through a more reliable and routable calling services & reduced maintenance. Another factor leading to VoIP market demand is the rising trend of workforce mobility. By deploying VoIP solutions, enterprises can improve communication and collaborations among employees and remote users to increase business productivity. Also, the enterprises are realizing the benefits of converged voice & data services to enhance their performance. The convergence of unified communication services & enterprise VoIP to enable live-chat, video-conferencing, and other calling capabilities is expected to fuel the VoIP market value. The hosted IP PBX segment in the VoIP market is expected to witness the fastest growth rate of over 15% from 2019 to 2025 as IP-based phone systems are hosted by service providers. Hosted VoIP eliminates the need to install any equipment on-premises, decreasing maintenance & training costs. Small & large enterprises are increasingly relying on these solutions, which will enable them to manage their phone systems while gaining access to advanced communication features such as call queuing, messaging, and auto attendants. This will allow them to focus more on their core competencies without investing a huge sum in costly equipment. The computer-to-computer VoIP market is expected to grow at a CAGR of over 10% during the forecast timespan. Computer-to-computer VoIP calling is the most widely used method adopted by organizations to facilitate domestic & international voice communications. Organizations are using softphone applications, which will allow them to make instant & free peer-to-peer conversations and provide features such as instant messaging, file sharing, and integration with social media platforms for free. For instance, Skype facilitates free video calls & group audio calls and offers instant messaging, allowing users to share files or pictures through attachments. 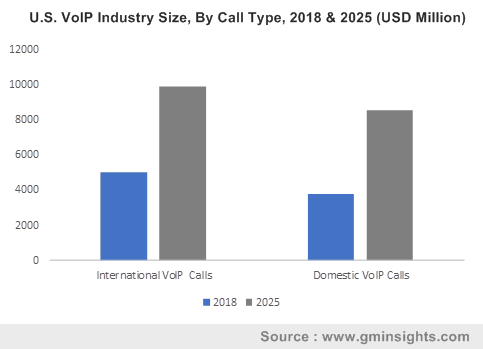 The domestic VoIP calling market is projected to exhibit a growth rate of over 12% from 2019 to 2025 due to its cost-effectiveness. Enterprises are leveraging the benefits of national calling plans to make free or unlimited calls via smartphones, computers or IP phones to connect to their employees and customers. The increasing popularity of Google Voice, Viber, and Skype and several offers with additional discounts and monthly bonuses provided by VoIP service providers to make domestic calls, spurring the VoIP market size. The mobile VoIP market is expected to witness the fastest growth rate of over 13% between 2019 and 2025. As mobile VoIP services depend on the reliable and high-speed wireless networks, the ongoing government & private-led investments in the wireless communication technologies such as 4G networks and upcoming 5G technology will increase the adoption of mobile VoIP applications such as Skype and Google Voice. These applications will eliminate the need for voice plans and provide high flexibility to enterprises to make unlimited calls. The large enterprises segment held major VoIP market share of over 55% in 2018. Reliable communications are of utmost importance to large enterprises to increase collaboration and productivity of the company’s internal processes to deliver exceptional services to customers. They are using managed and cloud VoIP that can unite their mobile workforce through a single set of communication tool to achieve business continuity and reduce cost. VoIP solutions provided by leading vendors such as Vonage, Nextiva, Mitel, and 8x8 support several calling capabilities such as advanced call routing, call analytics, and video calls, enabling enterprises to capitalize on emerging communications technology. The BFSI vertical is estimated to hold a significant share of over 15% in the VoIP market by 2025. Communication through several channels has become an indispensable part of the BFSI sector. The financial institutions and insurance companies need reliable and on-demand voice communication solutions to connect with their value chain partners and customers at low costs and without communication delays. Thus, the technology acts as a viable option for them to ensure connectivity and increase employee productivity and responsiveness. The BFSI sector is witnessing a surge in the usage of cloud-enabled IP phones and VoIP service plans to lower communication costs and to make business-critical decisions that improve team collaboration. 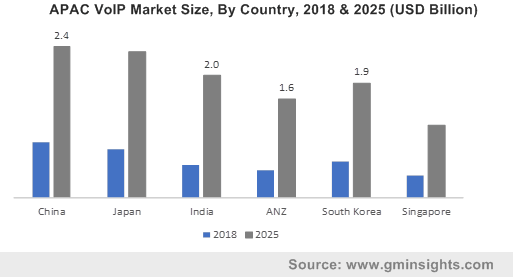 The Asia Pacific VoIP market is expected to grow at a CAGR of over 15% from 2019 to 2025 due to increasing internet penetration, rise in the number of smartphone users, and the growing utilization of cloud-based communication platforms. Enterprises in the region are adopting cost-effective communication solutions to manage their remote workforce. In October 2017, Velox Networks, a Singapore-based start-up introduced a new cloud-based PBX platform. The new platform enables customers to deliver communication services at low cost and includes functionalities such as voicemail to email and real-time updates on telecom expenditure. The services are also proving economical due to use of a single IP network for voice and data transmission. In this region, the countries including China, Japan, and South Korea have emerged as the largest markets for cloud-based services due to the rising number of service providers. The companies present in the region are offering mobile VoIP applications to a huge number of smartphone users. For instance, in May 2016, Tencent launched ‘WeChat Out’ with new VoIP feature. This feature helps WeChat users to make low-rate calls to mobile phones and landline globally. 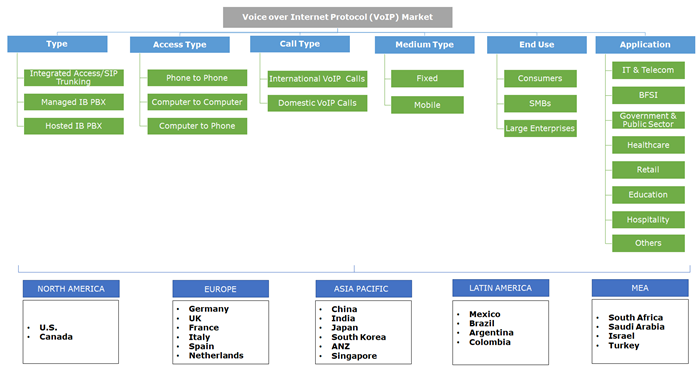 The companies operating in the VoIP market are adopting strategies, such as collaborations, new product developments, and acquisitions to enhance their existing offerings and expand their portfolio to target a greater number of customers. For instance, in September 2017, Voyage acquired New Zeeland’s leading local phone service company, Conversant. In April 2017, Voxox launched outbound calling to Mexico within the bundled cloud phone subscription plans. This launch helped enterprises the from U.S. and Mexico to access low call rate for VoIP services. However, stringent government policies for VoIP solutions in countries including Oman and Qatar are also affecting the market growth. The providers serving these countries may face huge economic losses in the long run due to ban on the softphone applications. Some of the major companies operating in the VoIP market are Alcatel Lucent, AT&T, Cisco, Citrix, Deutsche Telekom, Ribbon Communication, Google, Huawei, Microsoft, Orange, Telenor, ZTE, Nextiva, RingCentral, Verizon, Vonage, 8x8, Avaya, Mitel, and Jive Communication. VoIP technology has revolutionized enterprise communication by allowing organizations to cost-effectively streamline different communication modalities to improve business productivity. Traditionally, enterprises used PSTN to enable long-distance voice communication, which led to huge investments in the initial set up and IT staff training. To reduce the expenditure related to analog phone systems, the enterprises began adopting VoIP solutions to facilitate voice calls at affordable prices. With the growing popularity of enterprise mobility and extensive usage of web-based voice communication applications, the demand for these solutions will increase over the forecast timespan.